Essential plot rundown: A tire blows people's heads up, for no reason -or- WTF just happened? This was a really interesting movie. The concept was novel. Basically, a tire goes around killing people, while a group of spectators watch. Nothing is ever explained. Things just happened. Well, there is an introduction at the beginning that explains that Rubber is an homage to certain things. And thats all we get. (And that was probably the best part of the movie). I wanted to like this movie more than I did. I liked the concept and idea. However, it just moves too slow. There's the intro scene which is really cool but then nothing really happens for 20 minutes. And the ending dragged on for way too long. Actually, that is the only down side: it moves too slow. Everything else I liked. I really thought the cinematography was great. 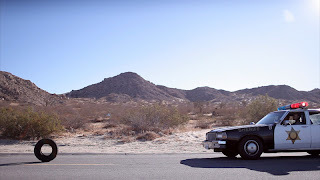 Most of the movie takes place in the desert with a tire, neither of which are interesting subjects. But, there are a lot of cool camera angles and compositions that make for an esthetically pleasing film. Overal, a decent film. Story: good. Cinematography: good. Pacing: bad. 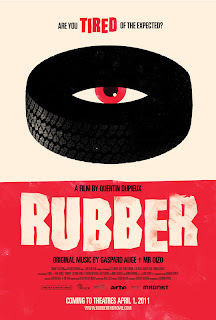 And that's really all I have to say about Rubber. It's worth checking out, but you won't be thinking about it the next day.